Whether you're a local or looking to make a special visit to the Grand Canyon state, here are the top half marathons that runners recommend for Arizona. Held on Halloween each year, this race is an opportunity to break from the norm and (optionally) dress up in costume to complete a half marathon! Photos are taken at the start and strategically throughout the race in an attempt to capture the best shots of participants, so be prepared to strike a pose! Late October will usually be quite warm however the race starts at 7am to give the best chance of optimal running temperatures. Click here to read more about the Haunted Half Marathon. Free shuttles will take you to the start line up by the San Tan Mountain Regional Park and the half marathon ends at the Crossroads Town Center. The course is downhill all the way with an overall elevation drop of 275ft. 6 aid stations along the way provide drinks and porta-potties (along with Halloween candy if you are so inclined), and the facilities are maintained for a 3 hour race duration. "I thought this was a well done race. Parking was easy. The time of year is perfect. The shirts were my favorite all year. My family loves them too. I will be back in 2016 for sure." The Yuma Territorial Half Marathon is a small rural half marathon set in the lettuce capital of the world, and is favored for its low key nature. This half marathon can be enjoyed by everyone as the favorable course design is conducive to setting a new personal best time. The half marathon is typically held in January so you can expect mild to warm temperatures and low rainfall. Click here to read more. The course begins at the Cocopah Casino and Resort with an initial decline of about 74ft at the start of the course followed by a straight, paved and relatively flat course along Highway 95 for 6 miles. The course is an “out and back” design so you’ll experience the 74ft incline just before the finish line. The Flagstaff Half Marathon is for the trail blazers! This 100% off road half marathon uses single-track, cross-country, and dirt roads for a tough off-road course in the Coconino National Forest. The marathon has been described as the most scenic and difficult marathon course in the Southwest and proceeds from the race help to support the Angel Fund at North Country HealthCare. The marathon is typically held in September so you can expect warm temperatures with a chance of rain, however the course elevation really helps to moderate the heat. Click here to read more. 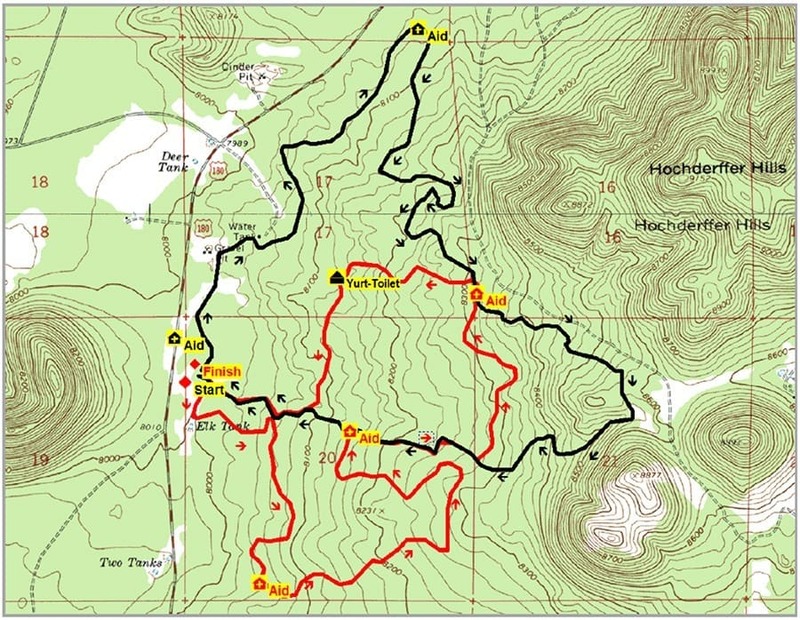 The course starts at an elevation of 8,650ft in the Coconino National Forest which will either be a problem, or a great challenge depending on your point of view. 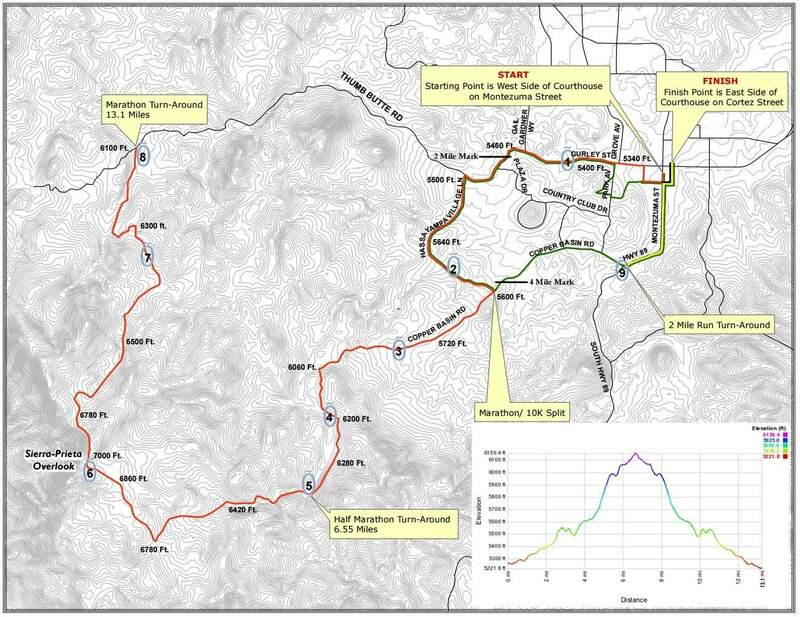 The half marathon course consists of a two scenic loops (black & red).The black loop is 6 miles in length and consists of one major peak with an elevation rise of over 580ft from the start point. The red loop offers three smaller peaks with peak heights of 100ft, 250ft, and 150ft. ​The Phoenix Half Marathon event was created by runners for runners, with the Half Marathon course also catering for hand-cycle and wheelchair participants as well. Half Marathon and marathon participants run side by side enjoying the diverse scenery from desert vistas to citrus groves. In true spirt of supporting the running community, all proceeds go to The Phoenix Marathon Foundation which aims to provide scholarship funds to high school students seeking a higher education (who have participated in running athletics). The marathon is typically held in February so you can expect mild to warm temperatures and the potential for rain. Click here to read more about the Phoenix Marathon. The course is fully paved and is a gentle downhill decline offering nearly 350 ft of net elevation loss making the course ideal for first time runners, personal best times and hand-cycle or wheelchair participants. The course begins in the township of Mesa where runners immediately join the full marathon runners who start earlier in the east, and then winds through the township with the finish line at the Mesa Riverview. Organized by the same people who run the Fiesta Bowl and Cactus Bowl, the Fiesta Bowl Half Marathon is a large event that raises funds for Food for the Hungry, and aims to promote a culture of community outreach and philanthropy. Held in December, the race is a great way to finish off your running year. Click here to read more. 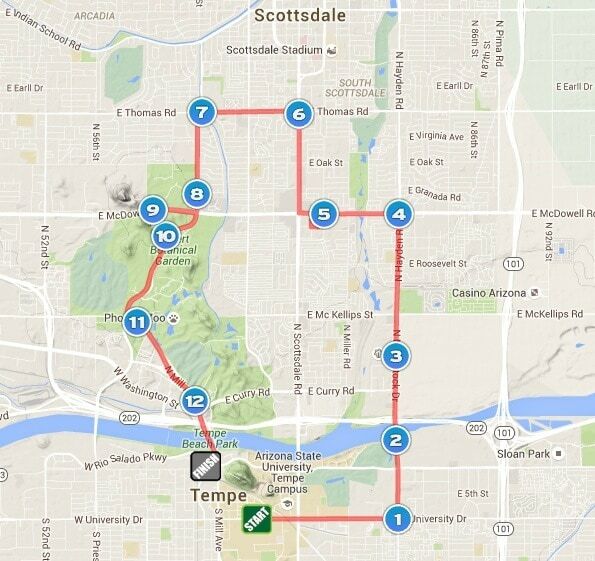 The Fiesta Bowl’s Half Marathon website describes the course as a flat, scenic loop through beautiful Scottsdale in ideal running weather. The route is fully paved and has 7 aid stations with water, energy drinks and gel provided. The Rock ‘n’ Roll Arizona Half Marathon offers live bands and a party like atmosphere from start to finish, with post-race festivities and concert at the finish line. The marathon is usually held in January which means sunny mild days with a chance of light rainfall. Click here to read more. The course has a gentle incline for the first 8 miles and climbs about 200ft over the following three, while enjoying the gorgeous view of Papago Park. Then the course has a steep decline (with a minor peak at the 11.8 mile mark) past the Rolling Hills Golf Club and Moeur Park, before crossing the Salt River to the finish line at the family friendly, action packed Tempe Beach Park. In true tribute to the Rock ‘n’ Roll heritage, alternative rock bands jam at the finish line to welcome you in. The Brian Mickelsen Memorial Run/Walk started out in 1992 as a Verde/Mingus Blowout 10K/2 mile event. The race was renamed and expanded in honor of Brian Mickelsen who was a beloved city manager that tragically passed away on a training run in 2007. The half marathon is usually held in April so you can expect warm temperatures with the potential for a little rain. Click here to read more about the Brian Mickelsen Memorial Marathon. The course takes you through the historic Old Town and meanders along the gentle hills up Sycamore Canyon Road where you enjoy views of the Verde River, and after 5 miles you’ll turn around and leave the Marathon runners behind. The course then takes you past Pecks Lake towards the Tuzigoot National Monument, then onwards past the Dead Horse Ranch State Park towards the finish line at Riverfront Park. The course is relatively flat with just a 138ft peak at the 2.5 mile mark. "Really enjoyed the marathon and the scenic view was beautiful." This Whiskey Row Half Marathon organized by the James Family Prescott YMCA is touted as one of the toughest races in the country. Proceeds from the Half Marathon go directly into the local YMCA’s scholarship fund to provide free athletic classes for families in financial need. The race is typically held in May; however Prescott’s high elevation thankfully sees cooler temperatures with average maximums in the mid-70s. Click here to read more. Starting at a lofty 5,280ft above sea level, the course climbs up to 7,000ft at its peak before turning back towards town. The first and last 5 miles are paved, with the rest being a well maintained dirt road surrounded by lovely forest scenery. 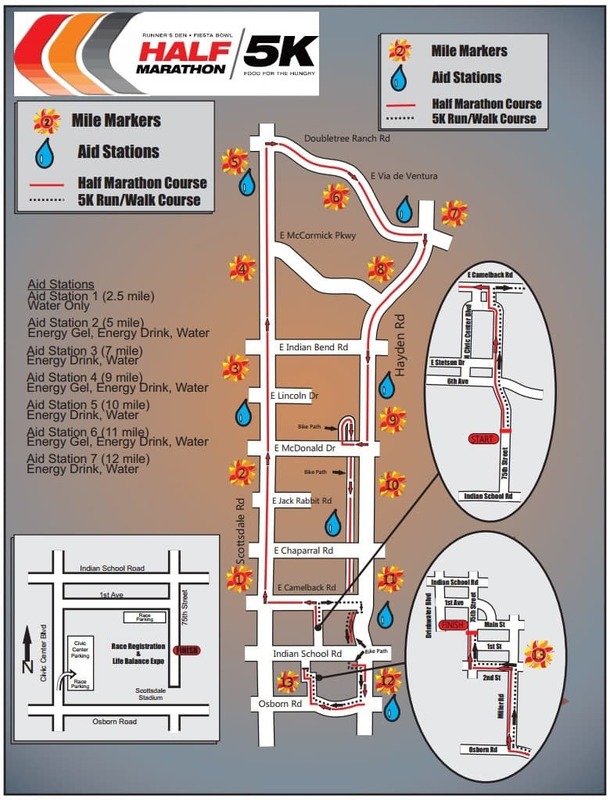 The half marathon has 5 water/aid stations; with most also having access to porta-potties. One of the Top Ten Most Beautiful Places on Earth (as named by Good Morning America), the annual Sedona Marathon takes you through the scenic Coconino National Forest District which is well known for its fascinating sedimentary formations. The event offers plenty of Southwestern hospitality and features many artists and live performances. The race is typically held in June so you can expect higher temperatures and low rainfall. Thanks to the fully sealed roads, the half marathon course is a little more resistant to bad weather events than the full marathon. Click here to read more. 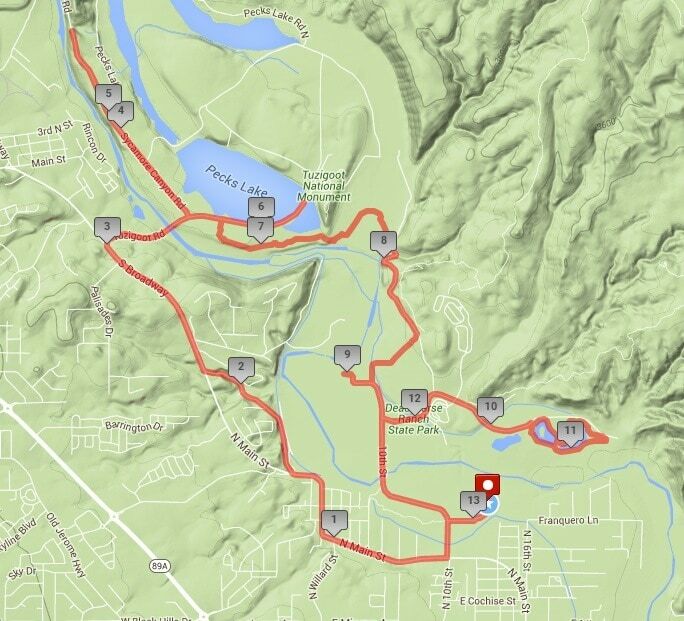 ​The course is scenic and hilly with a turnaround point at the 6 mile mark. The route taken is the same as the first part of the full marathon, with the turnaround point coinciding with the end of the paved road section. If you prefer to stay away from gravel and dirt trails, then the half marathon course should be your first choice. 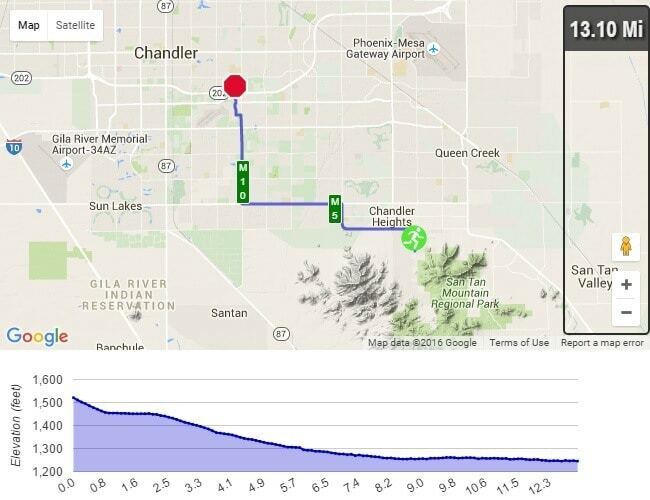 The course has four peaks (two peaks run twice) with a maximum elevation rise of 200 ft.